If you need access to the article always feel free to email. We evaluated a community prosecution program in Dallas, Texas. City attorneys, who in Dallas are the chief prosecutors for specified misdemeanors, were paired with code enforcement officers to improve property conditions in a number of proactive focus areas, or PFAs, throughout the city. We conducted a panel data analysis, focusing on the effects of PFA activity on crime in 19 PFAs over a six-year period (monthly observations from 2010 to 2015). Control areas with similar levels of pre-intervention crime were also included. Statistical analyses controlled for pre-existing crime trends, seasonality effects, and other law enforcement activities. With and without dosage data, the total crime rate decreased in PFA areas relative to control areas. City attorney/code enforcement teams, by seeking the voluntary or court-ordered abatement of code violations and criminal activity at residential and commercial properties, apparently improved public safety in targeted areas. 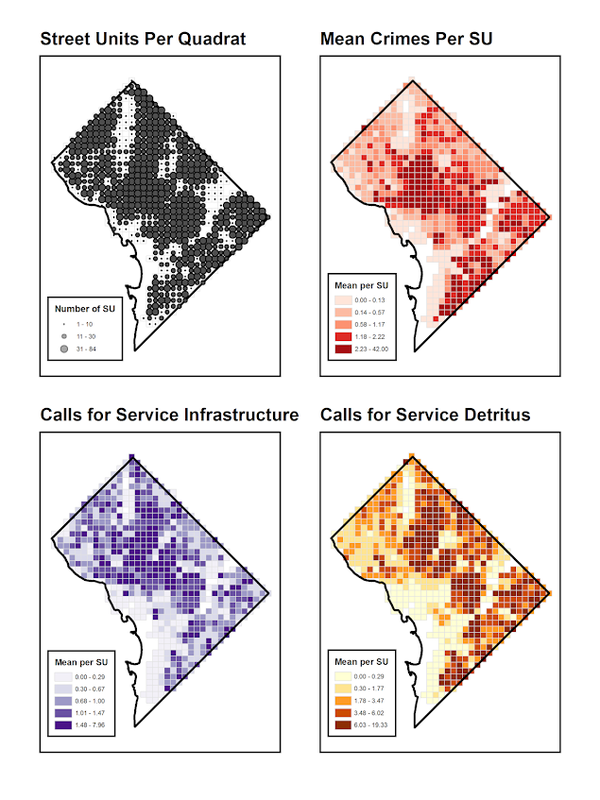 My paper, The Effect of 311 Calls for Service on Crime in D.C. at Microplaces, was published online first at Crime & Delinquency. Here is the link to the published paper. If you do not have access to a library where you can get the paper always feel free to email and I will send an off-print. But I also have the pre-print posted on SSRN. Often the only difference between my pre-prints and the finished version is the published paper is shorter! As a note, I’ve also posted all of the data and code to replicate my findings. The note is unfortunately buried at the end of the paper, instead of the beginning. This was the first paper published from my dissertation. I have pre-prints out for two others, What we can learn from small units and Local and Spatial Effect of Bars. Hopefully you will see those two in print the near future as well! My paper with Scott Phillips, A quasi-experimental evaluation using roadblocks and automatic license plate readers to reduce crime in Buffalo, NY, has just been published online first in the Security Journal. Springer gifts me a special link in which you can read the paper. Previously when I have been given links like that from the publisher they have a time limit, but the email for this one said nothing. But even if that goes bad you can always read my pre-print of the article I posted on SSRN. This article evaluates the effective of a hot spots policing strategy: using automated license plate readers at roadblocks in Buffalo, NY. Different roadblock locations were chosen by the Buffalo Police Department every day over a two-month period. We use propensity score matching to identify a set of control locations based on prior counts of crime and demographic factors. We find modest reductions in Part 1 violent crimes (10 over all roadblock locations and over the two months) using t tests of mean differences. We find a 20% reduction in traffic accidents using fixed effects negative binomial regression models. Both results are sensitive to the model used though, and the fixed effects models predict increases in crimes due to the intervention. We suggest that the limited intervention at one time may be less effective than focusing on a single location multiple times over an extended period. And here is Figure 2 from the paper, showing the units of analysis (street midpoints and intersections) and how the treatment locations were assigned. My article on estimating crime trajectories in Albany from 2000 through 2014 has been published in the latest issue of JQC. That link is permanent, but Springer gifts me a temporary free pdf link for everyone for up to four weeks. So grab that if you are interested. Here is the cross Ripley’s L plot testing for clustering between the different trajectory groupings. Also always feel free to send me an email if you have questions about the findings and paper. This year at the American Society of Criminology I will be presenting some work from my dissertation, Quantifying the Local and Spatial Effects of Alcohol Outlets on Crime. I have the working paper posted on SSRN, and that also has a link to download data and code to reproduce the findings in the paper. I will be presenting at the panel Alcohol and Crime on Wednesday at 9:30 (at the Cambridge room on the 2nd level). This paper estimates the relationship between alcohol outlets and crime at micro place street units in Washington, D.C. Three specific additions to this voluminous literature are articulated. First, the diffusion effect of alcohol outlets is larger than the local effect. This has important implications for crime prevention. The second is that in this sample the effects of on-premise and off-premise outlets are very similar in magnitude. I argue this is evidence in favor of routine activities theory, in opposition to theories which emphasize individual alcohol consumption. The final is that alcohol outlets have large effects on burglary, despite the fact that alcohol outlets cannot increase the number of vulnerable targets, as it can with interpersonal crimes. I discuss how this can either be interpreted as evidence that alcohol outlets self-select into already crime prone areas, or potentially that the presence of motivated offenders’ matters much more than increasing the number of potential victims. The most interesting finding is the fact that I estimate the diffusion effect of alcohol outlets is larger than the local effect. I then show that this is the case for some other papers as well, it is just interpreting the regression model is tricky. Here is a diagram showing what happens. The idea is the regression coefficient for the spatial lag is one orange dot, and the local effect is the blue dot. Adding a bar though diffuses to multiple places, so when adding up all the smaller orange dots, they result in more crime than the one bigger blue dot. I’ve updated the roadblocks in Buffalo manuscript due to a rejection and subsequent critiques. So be prepared about my complaints of the peer-review! I’ve posted the original manuscript, reviews and a line-by-line response here. This was reviewed at Policing: An International Journal of Police Strategies & Management. I should probably always do this, but I felt compelled to post this review by the comically negative reviewer 1 (worthy of an article on The Allium). The comment of reviewer 1 that really prompted me to even bother writing a response was the critique of the maps. I spend alot of time on making my figures nice and understandable. I’m all ears if you think they can be improved, but best be prepared for my response if you critique something silly. So here is the figure in question – spot anything wrong? The reviewer stated it did not have legend, so it does not meet "GIS standards". The lack of a legend is intentional. When you open google maps do they have a legend? Nope! It is a positive thing to make a graphic simple enough that it does not need a legend. This particular map only has three elements: the outline of Buffalo, the streets, and the points where the roadblocks took place. There is no need to make a little box illustrating these three things – they are obvious. The title is sufficient to know what you are looking at. Reviewer 2 was more even keeled. The only thing I would consider a large problem in their review was they did not think we matched comparable control areas. If true I agree it is a big deal, but I’m not quite sure why they thought this (sure balance wasn’t perfect, but it is pretty close across a dozen variables). I wouldn’t release the paper if I thought the control areas were not reasonable. Besides arbitrary complaints about the literature review this is probably the most frustrating thing about peer-reviews. Often you will get a list of two dozens complaints, with most being minor and fixable in a sentence (if not entirely arbitrary), but the article will still be rejected. People have different internal thresholds for what is or is not publishable. I’m on the end that even with worts most of the work I review should still be published (or at least the authors given a chance to respond). Of the 10 papers I’ve reviewed, my record is 5 revise-and-resubmits, 4 conditional accepts, and 1 rejection. One of the revise-and-resubmits I gave a pretty large critique of (in that I didn’t think it was possible to improve the research design), but the other 4 would be easily changed to accept after addressing my concerns. So worst case scenario I’ve given the green light to 8/10 of the manuscripts I’ve reviewed. Many reviewers are at the other end though. Sometimes comically so, in that given the critiques nothing would ever meet their standards. I might call it the golden-cow peer review standard. Even though both of my manuscripts have been rejected from PSM, I do like their use of a rubric. This experience makes me wonder what if the reviewers did not give a final reject-accept decision – just the editors took the actual comments and made their own decision. Editors do a version of this currently, but some are known to reject if any of the reviewers give a rejection no matter what the reviewers actually say. It would force the editor to use more discretion if the reviewers themselves did not make the final judgement. It also forces reviewers to be more clear in their critiques. If they are superficial the editor will ignore them, whereas the final accept-reject is easy to take into account even if the review does not state any substantive critiques. Often times I write abunch of notes on the paper manuscript my first read, and then when I go to write up the critique specifically I edit them out. This often catches silly initial comments of mine, as I better understand the manuscript. Examples of silly comments in the reviews of the roadblock paper are claiming I don’t conduct a pre-post analysis (reviewer 1), and asking for things already stated in the manuscript (reviewer 2 asking for how long the roadblocks were and whether they were "high visibility"). While it is always the case things could be explained more clearly, at some point the reviewer(s) needs to be more careful in their reading of the manuscript. I think my motto of "be specific" helps with this. Being generic helps to conceal silly critiques.